A stroll in the city gave us the opportunity to discover Vietnam's culinary delights. And since the country is a bustling destination for foreign business people and tourists alike, fast food culture is rapidly emerging. 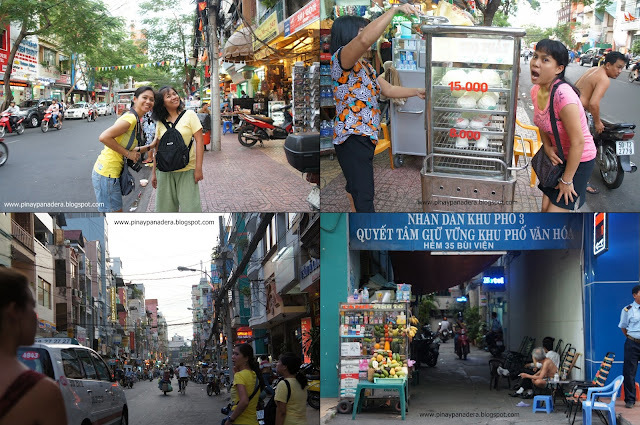 Here we were walking along Pham Ngu Lao, a busy backpacker district in Ho Chi Minh. The area caters to budget travelers, similar to Bangkok's Khao San Road. An Italian buffet restaurant on Pham Ngu Lao. Shop selling French Baguette sandwich. Entrails stall reminds me of adidas and isaw in Philippines. Heavy breakfast that I truly enjoyed. It may sound weird but I have this habit of eating at KFC in any countries I visit. I know I didn't live up to my promise of not eating meat again. Choux shop in HCM selling French pastries, baguettes and cakes. Korean fast food restaurant similar to KFC.